Melaleuca radula is a native of Western Australia. This Australian state bulges at the seams with interesting and colourful Melaleucas. Many species are not yet in cultivation. 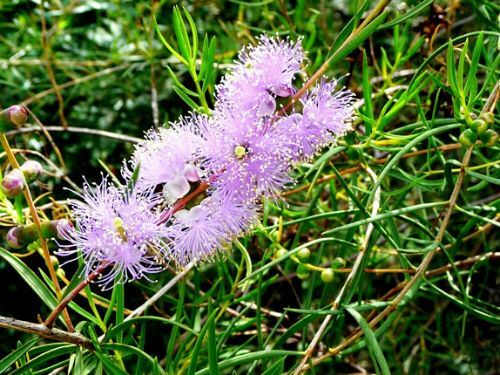 M. radula is known as the Graceful Honey-myrtle. It is an open shrub that will reach a height of 2 metres. The leaves are narrow-elliptical, aromatic and about four centimetres long with raised oil dots. Pink, mauve, purple or sometimes white flower clusters appear in spring and are carried for many months. Prune after flowering to keep the plants bushy and blooming bounteously. The Graceful Honey-myrtle prefers a sunny, well-drained situation. Melaleuca radula occurs in coastal areas around Perth. The species name refers to the radula which is a rasp-like organ used by molluscs to eat food. This is in reference to the raised, rough oil dots on the leaves. Propagate from seed or cuttings. We prefer to propagate Melaleucas from cuttings as they flower sooner than seed-grown plants.